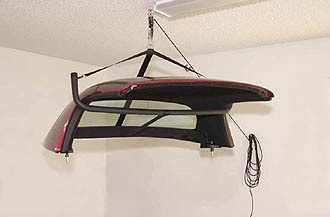 Using this hoist allows you to remove and install your hard top with just one person easily. 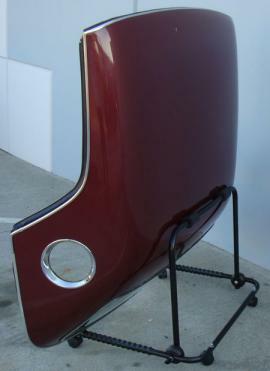 Designed specifically for the Z8 hard top. 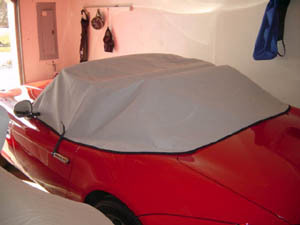 Your top is cradled by a lightweight aerospace 6061 T6 aluminum tube surrounded by high-density foam that supports the hardtop securely from beneath, avoiding paint and weather stripping. The hardtop is balanced with a connected harness of nylon seat belt webbing that is sewn with heavy-duty polyester thread to the required length. 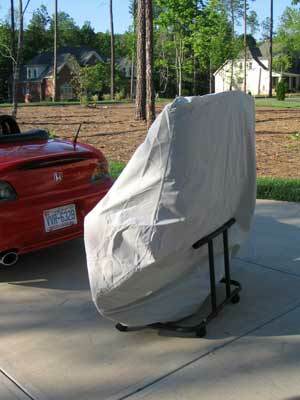 Your hardtop can be suspended indefinitely. Note: this picture is of the Z3 version. We'll post a Z8 picture as soon as one becomes available to us.